It’s our great pleasure today to tell you a little bit about our very special volunteer, Sherie from the USA. 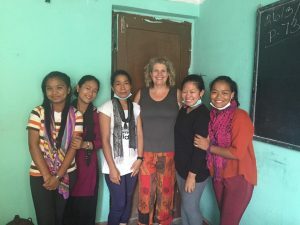 Sherie had a big birthday coming up and instead of presents for herself, she had the great and very kind idea to ask her friends to bring items to donate to students or needy communities in Nepal. Her kind-hearted friends supported this vision by heart and helped her collect 11 laptops in total. Imagine what this means to us, 11 laptops! 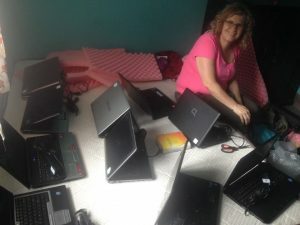 Not only did Sherie spend all this time and effort at home, she personally brought the laptops to Kathmandu. 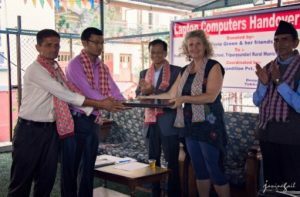 One of our local supporters, Pristine Nepal treks and Expeditions, coordinated a formal laptop handover ceremony to raise awareness for the kind donation and the work of Free Volunteering Nepal. A great success, as the ex-joint secretary of the Nepali Government, Mr. Deep Bdr Adhikari, joined the celebration. Everyone was so excited to see “Mrs. Sherie” (as Ganesh kindly refers to her) hand over 10 computers to Mr. Kumar Nepali, Principal of Shree Mahendrodaya Secondry School in Dhading! This large school’s computer lab has been destroyed by the 2015 earthquake and we could so far only help by repairing some old desktop computers, that remined of poor usefulness due to the very frequent power cuts in the region. The donated laptops will now enable regular computer lessons, that won’t be interrupted by power cuts, and will be extremely fruitful to teach practical computer knowledge to the students. Mrs. Sherie seemed to have fulfilled a dream of hers when she helped these rural students gain access to ample opportunities by learning computer skill using these computers. This indeed is of great importance to the future of these students, as the tourist sector and office work are the main independent job sources in Nepal, but our rural kids often cannot compete for these jobs with kids from urban regions that have access to better schools and computer training. 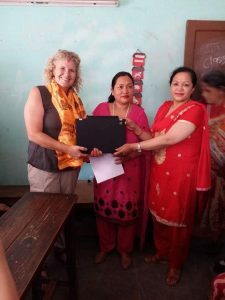 Mrs. Sanumati Rai (President) and Mrs. Anjana Shrestha (Principal) of the Shree Shradha Women Alternative School in Nagarjun Municipality near Kathmandu were very excited to receive one more laptop donated by Sherie. 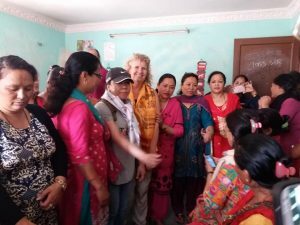 After Sherie handed over all the laptops herself, she then volunteered in the Shree Shradha Women Alternative’s School, Nagarjun, Municipality of Kathmandu as an English Teacher. You can see how much Sherie loved to teach and how much the students enjoyed listening to her native tones when she taught pronunciation of English words. Sherie, we could not be more thankful to you.  Your kind help will never be forgotten.